A sandbag with such dignity. The lessons of our youth often provide the experience and the means to cope with opportunities and problems that we face daily in adulthood. Viet Nam was an exceptionally "lesson-rich" environment. If I had to list the lessons learned that I use in home and work, I’m not sure where I would start or where I would end. They seem to guide and color almost every aspect of my life. I’ll go with sandbags. Each of us had a lot of experience and intimate familiarity with sandbags. They were so wonderful…..after you got them filled. I can’t count the times that sandbags saved lives. They stopped bullets. They stopped RPGs. They stopped mortars [except for those damned 240mm on the DMZ – when one of those suckers hit a bunker, the bunker collapsed]. They worked pretty darned well against mines when you lined the floor of your jeep with sandbags. They protected the FDC and made a protective wall around the guns for the crew’s safety. They even protected the crapper. I could go on……. Anyone assigned to a firing battery knew the routine. When you hit a new LZ, everyone dug and filled sandbags frantically for about 72 straight hours until the men and the position were as protected from the enemy as possible. Things were especially frenetic if you had to fire a lot during those initial 72 hours. In late ’67 through 1968, every time we went into a new area, the other side was already there, waiting for us, and we fired a lot a lot of fire missions while digging in. I’ve been thinking a lot about sandbags over the past 10 days. There are good reasons. I live in the desert. I have a long driveway. A normally dry wash crosses the driveway close to where the driveway meets the street. In the summer, we have monsoon rains. The above-mentioned dry wash becomes a raging river a couple of times each summer. When the water finally goes down, I’m left with over a foot of sand blocking the end of the driveway. I am so tired of digging out the several tons of sand each time this happens. But it’s either dig it out or learn to park about a quarter mile away. Hiring a guy with a backhoe costs a small fortune. All of the teen-aged boys for a mile away no longer answer my telephone calls after a heavy rain. Building a culvert cost over $15,000. The only solution short of buying a new house is to move the streambed. And that’s how sandbags re-entered my life about 10 days ago. Ace Hardware sells 25 large plastic sandbags for about $12.50. I bought 13 bundles [$176 with taxes and 325 bags]. I used them all and went back for more. It used to take about 300 sandbags to build my own bunker. And it took 72 hours or less to do it. After the bunker was constructed, I could still move my arms over my head and walk without limping. Obviously, I no longer enjoy those benefits since my body is still screaming at me from almost every muscle and joint about those 325 sand bags….each of which weighed about 80 pounds. 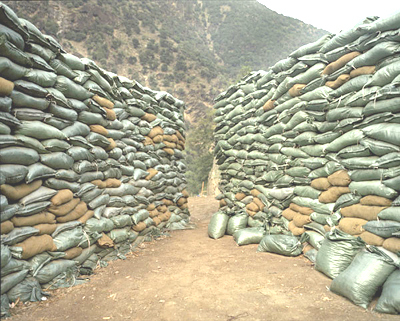 There is a fifty-foot, double sandbag wall of carefully and sometimes painfully filled sandbags waiting for the next flash flood down my wash. If the wall breaks, I have those extra bags waiting for filling. In the meantime, my neighbor across the street is in for a major surprise when the wall of water crosses the street! With every shovel of dirt and sand, I remembered the scope of what we built with sandbags. I thought it was pretty impressive when I saw what we did those many years ago. Now, still suffering from muscle and joint stress, I am awed by what we did with those sandbags. The "kid" could do it without the pain, but the "old man" can't.